The G52-EB is used to monitor the exhaust gas temperature (EGT) of turbo-equipped vehicles in conjunction with a pyrometer probe. EGT is an indication of how hot the combustion process is in a vehicles cylinders. Excessive EGT can cause engine or turbocharger damage. Many conditions can result in excessive EGT (i.e. too much fuel or not enough air) and are made worse when a vehicle is pulling a heavy load, climbing or running at continuous high speeds. The gauge is supplied with a “K” type EGT sensor and electronic boost MAP sensor interface. The boost has a peak hold function with a display range from 0- 35 PSI and programmable alert level between 10 and 30 PSI. The EGT function also has a peak hold function with a range from 0 to 1,000 °C and is programmable between 500 and 800°C. The EGT probe has a 1/8” NPT compression fitting and is supplied with a weld in mounting bung. The G52-EB gauge diameter requires a 52mm hole for mounting. 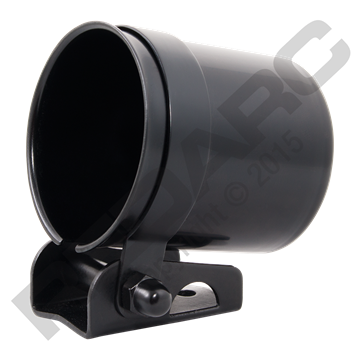 REDARC offer a range of mounting solutions including a 2” black plastic mounting cup (GH-CUP) and one (GH-MP1), two (GH-MP2) and three (GH-MP3) hole gauge mounting panels. Radio inserts are also available that suit the Toyota Hilux (GH-RI05). The REDARC 24 to 12 volt adaptor (GA-2412V) can be used to connect this gauge to a vehicle with a 24 volt ignition and lighting supply. Without this gauge i would have no doubt blown up my engine when i first fitted my turbo. Very often i found myself forgetting to look at the gauge and letting the egt's creep up to a dangerous, piston melting temp, but with the adjustable warnings for egt and boost, you don't really need to worry about it. The warning is un-missable, changing the screen color to orange or red, as you choose (i picked orange as it is a little easier to read the gauge as the warning is on) and beeping loud enough to hear over low - moderate music (and loud mud tires.) There is also the option to connect to an external warning using a relay wire. The only thing i can think of that would improve this gauge is for the red arc on the outer gauge to start at the temperature that you set your warning at, (it's not a changing part of the lcd display and is visible with the gauge off,) as a dangerous egt level for my engine starts at around 600 degrees and the arc on the gauge starts at 700, more suitable for modern diesel engines unlike mine. Would very highly reccomend this gauge and others in the range, i even get complimented about the gauge by passengers in my 4wd. It really is a good bit of gear and i'll be buying the same for my next 4wd. The REDARC 52mm G52-EU boost/vacuum gauge monitors exhaust gas temperature and boost/vacuum pressure in your manifold.